Today I present for your delectation three lovely bronze brooches, all of which were unearthed at Brough in eastern Cumbria. They are officially ‘romano-British’1 which means that they date to the four hundred years after the roman invasion; but archaeology suggests that they are the products of a bronze workshop on this site in the 2nd century CE2. Brough is a signficant historical and archaeological site. When we look at a modern map, we assume that the main route into Cumbria has always been the M6 but this isn’t the case. The north-south route, despite its roman road (the A6, more or less), was not as significant as you might think. When the railway line was cut parallel to the A6 in the 1870s, engineers had to make 14 tunnels and 22 viaducts just to get the gradient under 1 in 100 and thereby traversable by the latest in high-powered travel at the time, the steam train. The more practical route for centuries –millennia, perhaps – was the Stainmore Pass, or, was we know it, the A66. The romans built the fort of Verteris here, with a substantial vicus and bath house. Unfortunately, William Rufus agreed with the romans on the tactical usefulness of the position and built his own castle smack-bang on top of the roman one at the end of the 11th century, destroying most of the castle’s remains in the process. All three brooches feature what we shall, for convenience, describe as a triskele pattern. 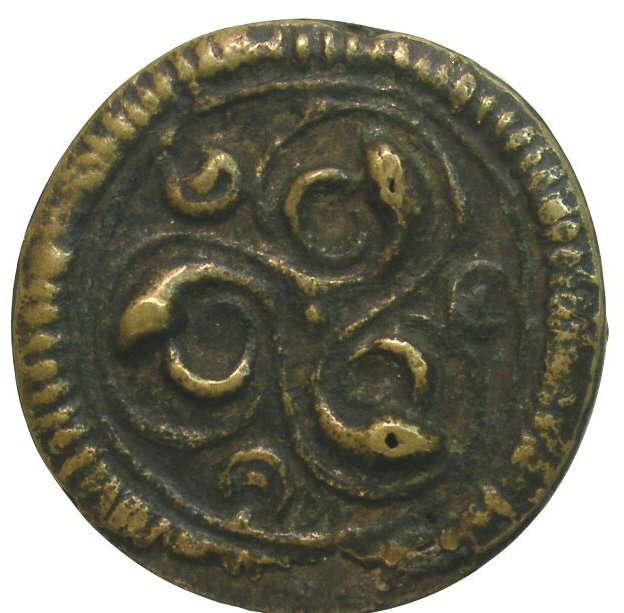 Three-fold circular patterns are a motif often seen in Europe from prehistory through to the late anglo-saxon period. An early example is the 3,000-year-old carvings on the entrance stone to Newgrange in Ireland – a magical place aligned so that the first rays of the rising sun enter the main chamber at the midwinter solstice – albeit these examples are a continuous circle; if you were drawing it, the last stroke of your pencil would join up with the first. The triskele designs from Brough are of two types; the most damaged is reminiscent of the Isle of Man logo, with three ‘legs’ joined at a central point. The other two consist of three curving lines that nestle against each other but do not actually touch. 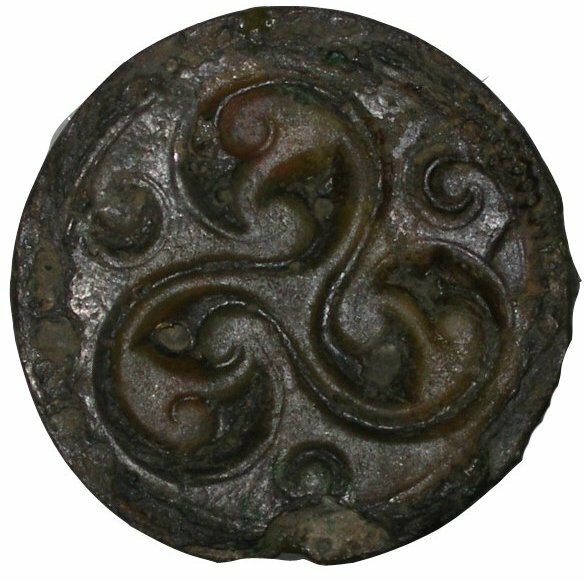 The first triskele brooch picture here – whether by distinction or accident of catalogueing! – is categorised by the British Museum as La Tène, and has a distinctly snake-like appearance. The second example was both tinned and enamelled, so it would have been silver in appearance, with coloured additions. 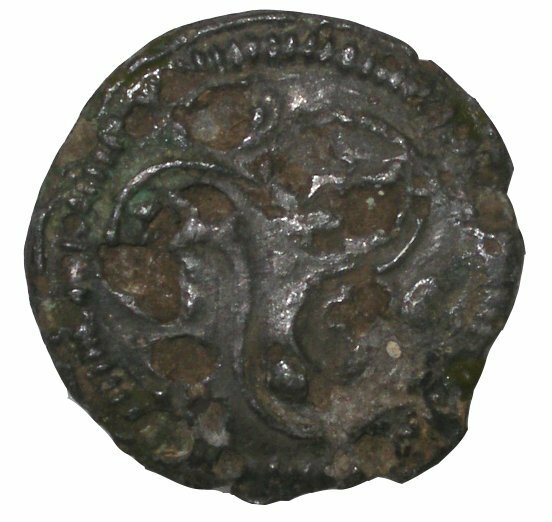 The third example is the most damaged, and the ‘true’ triskele as the three ‘arms’ are joined at the centre.We have no historical source for the meaning of the triskele symbol, despite its long popularity. It may have been popular with celtic peoples but it was in use long before they adopted it. At the Newgrange burial chamber, it’s easy to imagine that its version of the triskele, with no beginning and no end, was about eternal life. Celtic culture was fond of triplicity in many forms, with examples of matronae, or triple mother goddesses, found throughout western Europe during the roman empire. There may have been triple gods, too; Teutates (tribal father), Esus and Taranis (thunderer)3 were associated with 1st century celts, and genii cuculatti (hooded spirits) tend to be portrayed in threes in Britain in the period in which the brooches were made. These were followed (in written form, at least) by the triple forms of the Irish Brigid and Morrigan. It’s possible that triplicity has meant different things to different peoples, just as it does today. There are many who would say that it represents land, sea and sky; earth, air and water; maiden, mother and crone; mind, body and soul. It has also been adopted as a representation of the christian holy trinity. There are even a couple of incidences of it being used for nefarious purposes which I shan’t spell out here for fear of the effect on Google. There’s always the possibility, of course, that it was just an attractive bit design but we 21st-century folks can’t resist adding ‘ritual’ meaning to them. Until we find the 1800-year-old bronze-worker’s manual, we’re just guessing. See the British Museum’s entry. Please note all three pictures are the British Museum’s copyright. See the Scheduled Ancient Monument details. The 1st-century roman writer, Lucan, mentioned these three as gods requiring sacrifices, and it’s often been taken to mean that they are three aspects of one god. He doesn’t actually spell this out, though, so they may not be. 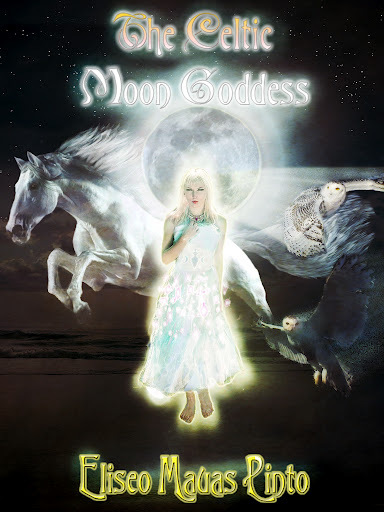 I am proud to share with you my new Ebook release regarding “The Celtic Moon Goddess“. Most of you might probably be aware of the significance of the “Mother Goddess”,a term used to refer to a deity who represents “motherhood, fertility,and creation”. “The Celtic Moon Goddess” is not only a brief compendium regarding the passionate and ancient believes of the Celtic People, but certainly a good source of information to be read for all those lovers of all things related to the Goddess. Many different goddesses have represented motherhood in one way or another, and some have been associated with the birth of humanity as a whole. Others have represented the fertility of the earth, but how about the ““Moon Goddesses” then? 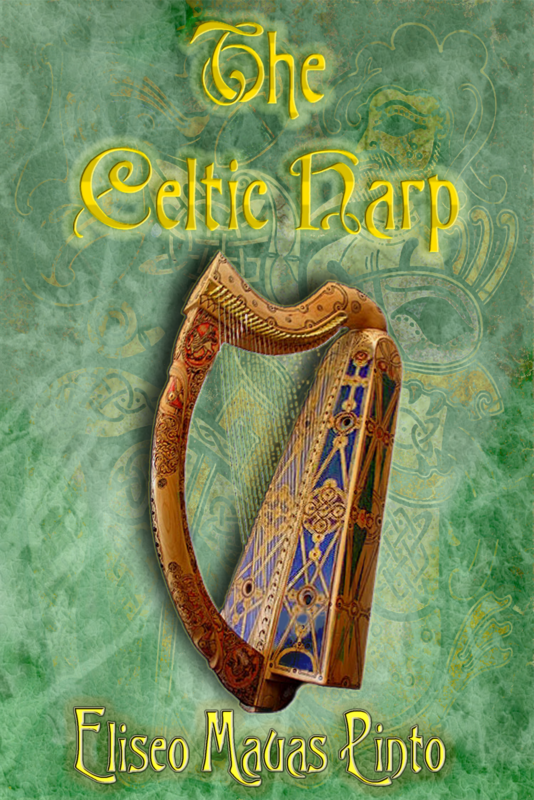 On this book you will certainly may find a good source of information to be read not only regarding “Arianrhod” and “Rhiannon”,the two main “Moon Goddess” for the Celts, but also further relationships regarding the symbolism and significance to those lovers of all things related to the Goddess. Let the Moon and Stars pour their healing light on you and keep on sparkling in our souls… Bliss and blessings to you all! A triple spiral is also called a triskele or triskellion, which has three arms. On a piece of jewelry, this represents the number three. This is said to represent the Triple Goddess or to Christians, the Holy Trinity. Some people believe it represents the phases of life – life, death and the rebirth. Supposedly, the spiral has some mystical powers that will keep evil from crossing. This is why you so often see this on jewelry as well as in many sacred places in the Celtic world. In Celtic jewelry you’ll often notice the elegant knot work. The Celtic knot is a sign that there is no beginning or end, that everything is like love eternal. The knots are all so very intricately woven together to show how our life is woven together with the people that surround us. The knot is a symbol of the intricacies of everything in our world. The knots are also said to keep evil out. Another Celtic symbol that is often seen on jewelry is the Celtic Cross. 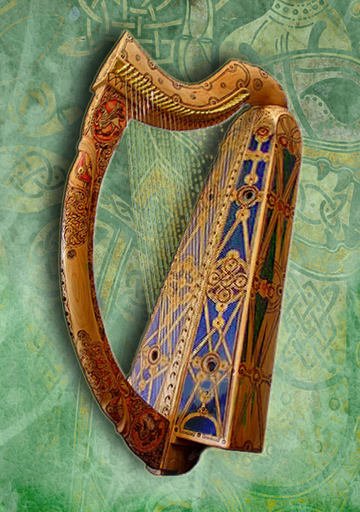 Long ago, it was said that St. Patrick was the one who introduced the Celtic Cross to the Pagans of Ireland. He wanted to teach Pagans how important the symbol of the cross was in Christianity by putting it together with the sun. To do this, St. Patrick combined the cross with the sun wheel. For Christians, the circle they see at the top of the cross is a sign of everlasting love that God has for humans.All of these Celtic symbols are kept alive through the craftsmanship of jewelry today and are a symbol of old history. 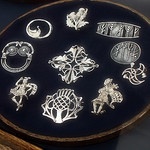 Wearing these as a piece of jewelry isn’t just another decoration, but a celebration in a sense of the Celtic culture that brought them about today. Justin Henderson writes about jewelry, and fashion.